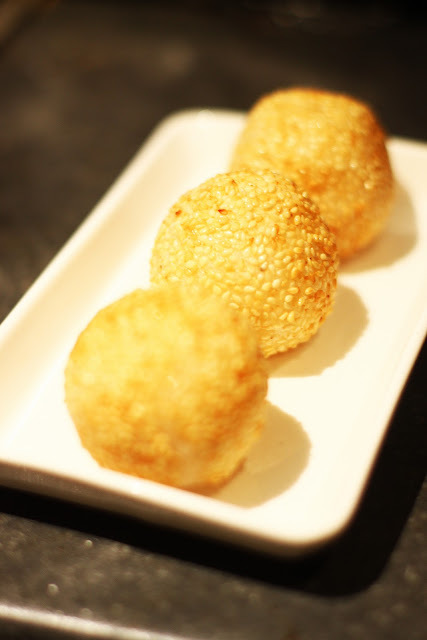 Jin deui (sesame seed balls) is a type of fried Chinese pastry made from glutinous rice flour and commonly found in the Far East. The rice dough of the pastry is coated with sesame on the outside and is crisp and quite chewy. Inside of the pastry is a large hollow, caused by the expansion of the dough，which is partially filled with a filling usually consisting of lotus paste (蓮蓉). Alternatively black bean paste, called dousha (豆沙) may be used, and less commonly red bean paste (紅豆沙). I just mix glutinous rice flour and water into a dough, divide them in to little balls then wrap some green bean paste in it.